Sabah, situated in the north-east of Borneo, is known for its natural scenic beauty and fascinating wildlife. Two and a half hour's journey from Sabah's Capital Kota Kinabalu, Mount Kinabalu (13,500 ft) is often described as the pride of Sabah. Trekking and mountaineering are undertaken here. 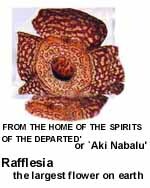 The world's largest flower, Rafflesia, can be sighted at the top. Located near the Capital town is the open air Sunday Market called Kota Belud. Near the border is Batu Punggul, which has an adventure camp and offers jungle walks, canoeing and cave visits. Just a short boat ride away from Kota Kinabalu is Tunku Abdul Rehman National Park, a haven for sea sports. Kota Kinabalu, destroyed in the Second World War, is today a commercial centre and holiday destination. Sipadan island on the east coast boasts of snorkeling advantage.